If you follow Kim Kardashian on Instagram then you know that she puts in work at the gym. In fact, some people would consider her their own version of fitspiration. But she wouldn’t have shaped her famous assets without some help. Thanks to her Latina personal trainer, Melissa Alcantara, AKA, Fitgurlmel, Kim is held accountable by one of the best in the industry. 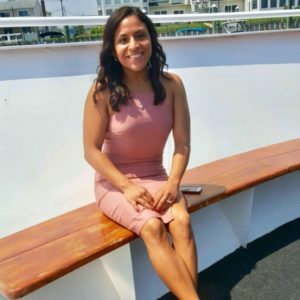 Although Alcantara’s client is normally the one stealing the spotlight, she also deserves some recognition for the hard work that’s brought her to where she is today. If you look at Alcantara’s physique (and 8 pack!) you would never guess that she had been overweight and out of shape at any point in her life. In fact, growing up in a Dominican family in the Bronx only made life more challenging for the 33-year-old and her family. “My mom worked two jobs in order to support all of my siblings, and we had the stereotypical drug addict and alcoholic father who wasn’t there or was there to make everyone’s life more difficult,” she tells HipLatina. Not to mention the lifestyle her family maintained was far from healthy. It didn’t hit her that she needed to make a change until she gained 70 pounds during her pregnancy and ended up tipping the scale at over 200 pounds. After trying out Weight Watchers, dabbling in Jiu Jitsu, and eventually bodybuilding, she transitioned into working as a personal trainer. “I never set out to be a trainer or social media fitness chick,” she explains, elaborating that all she wanted to do was achieve her best self. “Now, I work with other people who want it just as bad as I do, and in order to do this, you have to want it for yourself and do it whether you’re motivated or not,” she asserts. It’s no surprise that the hard-working Alcantara ended up linking up with the Kardashian powerhouse. Interestingly enough, Kim was the one who tracked down Alcantara when she came across her inspiring Instagram account. Kim was impressed by Alcantara’s body transformation after seeing her own journey to lose the 70 pounds she’d gained during her pregnancy with her now, six-year-old daughter. “Something told her [Kim] that she needed to contact me because she wanted to be strong and healthy and to do it the right way A.K.A. the hard way,” Alcantara recalls. “Three days later we were chatting at her apartment in NYC and we really connected on a personal level,” she says. Coincidentally around this time, Alcantara was preparing to move her family to Los Angeles, where Kardashian resides and this was just the start of their training friendship. Although adversity comes in all forms, especially for a woman of color, Alcantara hasn’t let that get in the way of her success. She acknowledges the fact that the majority of diverse trainers she’s met in the fitness industry aren’t as well-known as mainstream ones, but instead of letting it get to her, she continues to strive forward.“ I focus on doing the best and having the most sustainable approach to fitness which people appreciate and they DO IT by following my workouts and eating a meal plan I provide for them,” she says. It’s also the same approach she takes during her own training sessions when she focuses on the repetitions of an exercise at hand and the not the difficulty behind it. In fact, she believes that the healthiest approach is to ignore the negativity. “At the end of the day, we all experience some push back or rejection, but that usually comes from negative people, aka HATERS, who are a clear sign that you’re doing something good and you should continue,” she insists. One look at Alcantara’s Instagram page and you can tell that she has an all or nothing approach to fitness. As a result, she hopes to teach women that they shouldn’t be afraid of lifting heavy or adding certain foods to their diet. “Women think that if they pick up a dumbbell they’ll turn into men; this is utterly ridiculous, the human body doesn’t work that way,” she says. Then to make matters worse, many people are convinced that eating carbs is a bad thing. “[Healthy] Carbs are needed, and some people actually need a lot more carbs than others depending on certain factors such as their genetic type,” she explains. Additionally, many women are doing detox teas, eliminating carbs, and overdoing it with the cardio, only keeping them stuck in the yo-yo dieting cycle. “This approach is hormonally taxing to our bodies, unsustainable and quite unhealthy,” she warns. When Alcantara and Kardashian got together, she made it her duty to teach Kim the in’s and outs of what a healthy diet and fitness routine looks like. When Kim trains, Alcantara says she’s doing everything from squats, deadlifts, lunges, barbell curls, plyometrics, to high intensity interval training. She even shared with HipLatina a sample of the workout Kim does on a regular basis. Try it out below! The celebrity trainer may be tied to one of the biggest names in entertainment, but she’s constantly finding ways to innovate herself. Currently, she’s traveling with athletic clothing brand Gymshark to promote health and fitness, and aims to make high level training accessible to anyone. She even posts all her meals and her workouts on her Instagram account as well as on her YouTube page. “Every single day, I answer messages from my followers and I make sure to give them my direct attention, I want all of them to thrive!,” Alcantara says enthusiastically. For now you can catch Alcantara on episodes of Keeping up With the Kardashians, and she hopes to take on more challenges that may include projects beyond fitness.